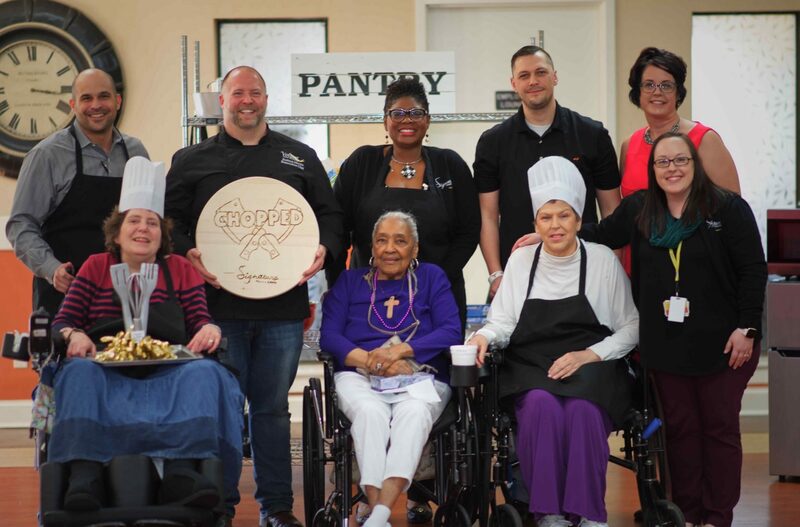 Louisville, Ky – March 29, 2019 – Individuals at Signature HealthCARE at Rockford Rehab and Wellness Center participated in their own version of Food Network’s television show, Chopped, on March 28. Similar to the show, there were three judges and three teams. Chopped winner and Executive Chef at Volare Italian Ristorante, Joshua Moore, partook in the fun, but this time he sat at the judges’ table. He served as a special guest judge, alongside Signature HealthCARE at Rockford Nurse Practitioner Dawn Koop, and Signature HealthCARE at Rockford Social Services Director, Dana Gardner. Teams consisted of one resident and one stakeholder. 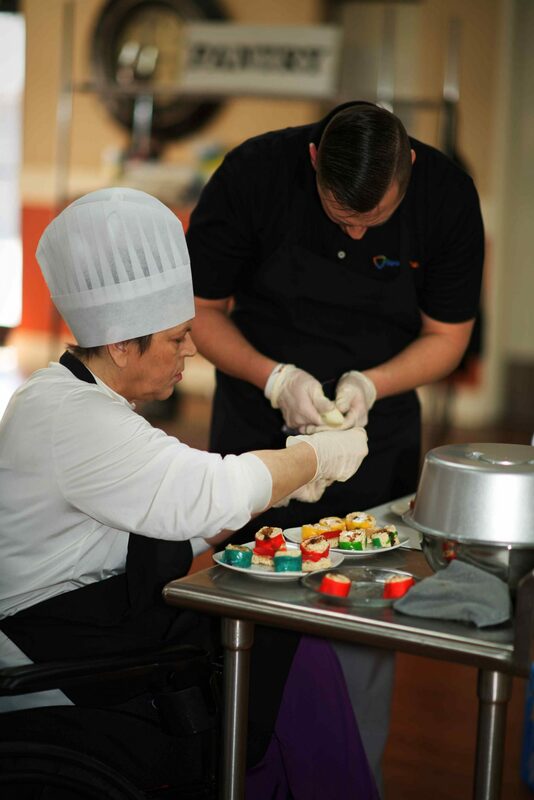 Resident Pearl Anthony and Signature HealthCARE Administrator, Trina Manuel-Jagoe, made up team Almond Joys. Team Rockford Triumph included resident Anna Marie Fernihough and Signature HealthCARE Regional Vice President, Adam Mather. Resident Katherine Horwatt and Rehab Service Manager, Jason Stengel, made up team Yum Yums. Each team had to bake a dessert using any ingredients they chose, including the three required ingredients of cream cheese, graham crackers, and hot cocoa. From Rice Krispies filled with a peanut butter and cream cheese mix sushi roll to a chocolate milkshake with graham cracker toppings, many unique desserts were created. After the maximum time of one hour was reached, teams shared their desserts with the judges for a sampling and presentation. Teams earned points for the presentation of the dessert, the ingredient usage, and the taste. While the judges deliberated with one another, teams and audience members eagerly awaited the announcement of the 2019 Chopped Champion at Signature HealthCARE at Rockford from Chef Josh. Team Rockford Triumph rose to the challenge and earned the Chopped trophy with their warm chocolate soup topped with toasted pistachios, while the Almond Joys and Yum Yums desserts arrived on the chopping block. “I didn’t ever think this was going to happen like this. It feels really good to win. I can’t wait to tell my family,” Resident and Signature HealthCARE at Rockford Chopped winner, Anna Marie Fernihough, said. Find the best facility option for you and your loved ones. Have a question? Need to share a comment? We love hearing from you. ©2019 Signature Healthcare. All Rights Reserved.